ESEOE'S LATEST MARBLE DIFFUSER--- The diffuser uses this year's popular marble texture design to make the look more textured. At the same time, it has a large capacity of 550 ml and has an effective working time of up to eight hours. 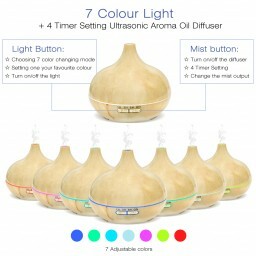 Of course, you can also drop your favorite essential oil into the humidifier, it is also a perfect fragrance diffuser! 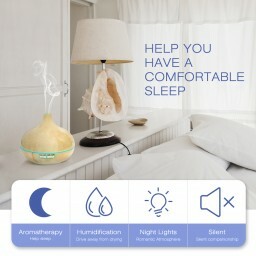 EASY TO OPERATE, NO TIME WASTED--- It can be used as an aroma diffuser, humidifier or night light. You can tap the fog button on the right to set its working time according to your needs (four time modes). Tap the left light button to choose from 7 colors, or choose the color you like to create a soft atmosphere. WATERLESS AUTOMATIC POWER OFF FUNCTIOM--- ESEOE always puts customer safety first! It can work continuously for 8-10 hours. When there is no water, it will automatically close to ensure your safety, which will definitely give you a calmer, more relaxed and safe environment. 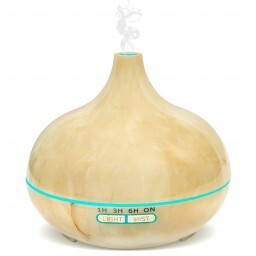 REASONS FOR HAVING TO BUY--- Unlike other ordinary wood humidifiers, the outer cover of our humidifier is more transparent. At night, the marble pattern will be perfectly integrated with the LED lighting, which will turn into a particularly warm night light, providing a warmer atmosphere for your room! WHAT YOU GET--- 1*diffuser, 1*adapter, 1*product specification and we offer you an 180-day warranty and friendly customer service. If you have any questions, please feel free to contact us.